William Morris was an English artist, poet and politician. He was incredibly creative and he produced decorative art in a range of different forms, including: textiles, furniture, wallpaper, stained glass windows, book design and tapestry. Below are some facts about William Morris. Some the information you will probably already know, but hopefully some will be new to you. 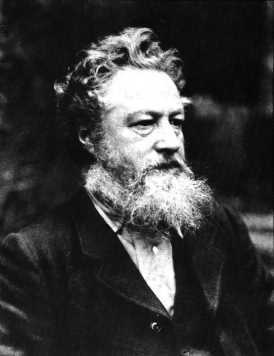 William Morris lived and worked during the Victorian era. He was born in 1834 and he died in 1896. He earned a degree from Exeter College, Oxford. After his graduation he started to work as an architect. William Morris was friends with the painters Edward Burne-Jones and Dante Gabriel Rossetti, and he soon stopped being an architect in order to become a painter. In 1859 William Morris married Jane Burden. Soon after they had a house built for them on Bexley Heath. The house was called Red House and was designed by Philip Webb. William and Jane designed all of the interiors and decoration themselves. They spent about two years getting the house just right, doing much of the work themselves. They were so happy with the results that they decided to start their own fine art craft work company. In 1861 their company, called Morris, Marshall, Faulkner and Co., started to make furniture, tableware, soft furnishings and wallpaper. All of the items produced were handcrafted. By the mid-1860s, William Morris concentrated on designing wallpaper. His patterns were inspired by the natural world, and these are some his best-known works of art. In 1875 William Morris started a new company, Morris and Co.
William Morris wrote many poems during his lifetime. Most of his best work is heavily influenced by the Icelandic sagas. He set up the Kelmscott Press in the early 1890s. This company published books which contained beautiful illustrations. In 1883 Morris joined a political party called the Social Democratic Federation. He also helped to start a new party called the Socialist League. When William Morris died in 1896, his doctor said that Morris had carried out the work of ten men during his lifetime. Follow the link to find out more about some other famous Victorians. Thank you! Just what my son needed for his year 5 school homework. Not too complicated, but in depth enough to write a short biography. My son needed this for his Year 5 homework as well. He has learned a lot for his homework. Me too my daughter needed this for year 5 homework . Thank you so much! awesome, just what I needed for my homework, thanks! This is very useful for my youngest son he needed quick facts that weren’t too complicated. I think, personally, William Morris was an amazing person. He inspired me to be an artist, amazing! I have been inspired by William Morris! Thank you. I couldn’t understand the facts on Wikipedia. These notes have helped me finish my art homework and not get DETENTION! Yes thank you this website has now stopped me from getting detention!!!! I loved this website about William Morris (aged 11). Thank you! This was just what I needed for my year 5 homework. The information was good and I could easily understand it. Thanks, Hollie. I’m really glad we were able to help you out with your homework. Please visit us again when – we’re adding new facts and information all the time. Thanks, Elle. Really pleased we were able to help you out. hey ty i finaly finished my art work! This has helped me alot with my homework, thanks very much. Thanks so much! This helped a lot with my year 8 art homework! Perfect introduction to my William Morris art lesson for my Year 2s. thank you so much, this helped me with part of my first piece of year 8 art homework. Now my form tutor/art teacher/l4l teacher cant give me a detention!!!! Glad you’re not going to get a detention! I really needed this for my year 7 homework and i had to write a whole page of facts so i just copied these facts down and yay i had a full page of facts! this really helped me i don’t know what i would have done without this. It really helped me for my year 8 home work. I learned a lot. This web really helped me with my Graphics year 8 homework. this helped me lots for my homework as well for year 6! this is a really useful website for anything! helped me so much in art. i wrote a fantastic biography. thanks so much. i am a Y6 student by the way. So helpful thanks. needed it for yr 7 art homework. this website helped me with my yr 5 homework. thanks!!!!!!!!!!!!!!!!!!!!!!!! Thanks, this helped with my year 8 homework! helpful for my year 10 biography about William Morris. Thank you.